All transactions are safe and secure with a reliable history in online purchasing behind each of our associates. Buy the Heroes Character Squares t-shirt to own Heroes clothing and merchandise. These Heroes tees feature twelve images on the front, and are perfect to wear with Sylar's watch. Watchmaker Gabriel Gray had been repairing the German watch for seven years, before deciding to abandon his current life and take the watch's name as his own. Sylar's watch reads 8:30 when he arrives at Zane Taylor's home. The squares tee is a bestselling Heroes merchandise item. 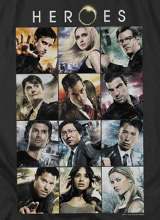 In addition to the Heroes Character Squares tee above, browse the Heroes Clothing Gallery for more apparel like men's and women's clothes, kids shirts or hoodies.